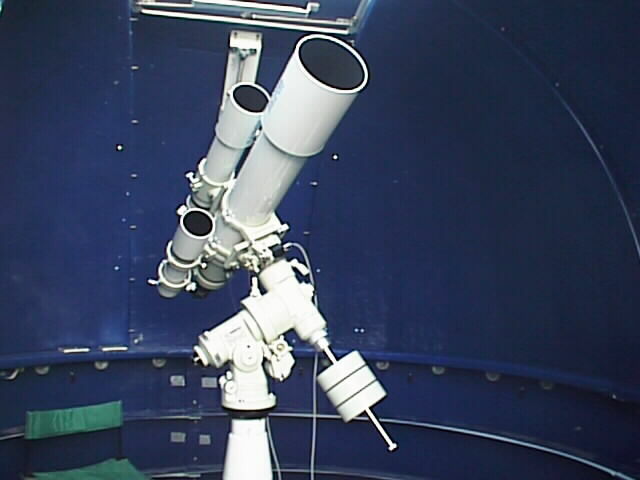 This photo shows the Takahashi FS-128 refractor that I used for most images when I first started doing astrophotography. At the time this photo was taken, the refractor was set up in my observatory. The scope has a focal length of 1040mm, and a focal ratio of f8. I have a reducer that changes the f-ratio to f5.9. This scope came with a 4 inch focuser. The scope also has a built in camera angle adjuster that allows a camera to be rotated to better frame the image without losing focus. A Takahashi NJP mount is used to support this optical tube assembly. I find this scope to be very portable. I usually set it up on a tripod to take advantage of dark skies away from town. I frequently use this scope for visual observations as well. List of images taken with the FS-128.